A.R.T. 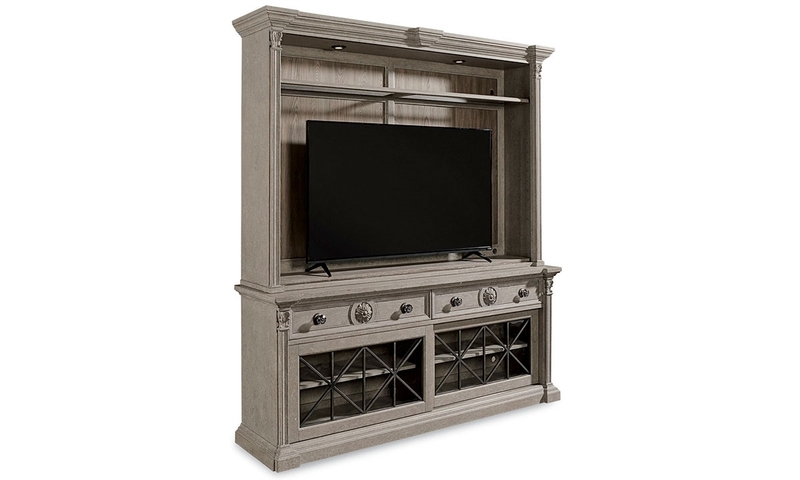 Furniture successfully unifies neoclassical detail and modern functionality with the Architectural Salvage entertainment center. This 2-piece unit includes a hutch topped with cornice molding and a console with hand-carved pilasters in an aged mist finish. The hutch features LED touch lighting, as well as six shelves with glass insets for use as a bookshelf or display case. Remove the middle partition and four lower shelves to house a TV, and place game systems, a DVR and more on the two shelves behind the console’s sliding glass doors. Two full extension drawers flaunting bellflower medallions complete either setup with additional storage.